Dumplings are one of the most Chinese popular dishes. After all, who doesn’t love going to yum cha and ordering your favourite dim sum dishes? The experience is certainly unique – with the waiters pushing around carts with a variety of options. Chances are that you’ve found yourself looking at food without really knowing what it will taste like. 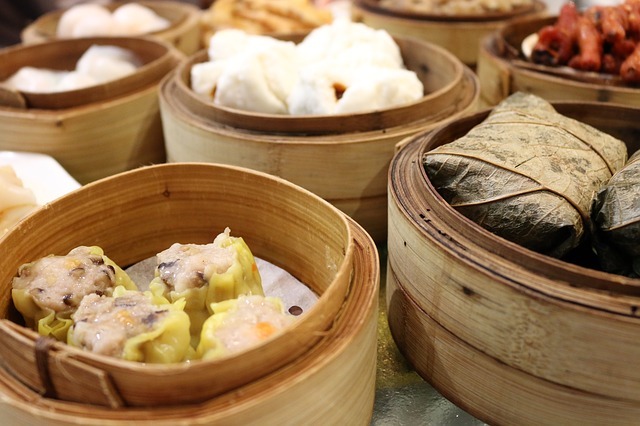 Whether you’re new to the Chinese dumpling scene or you’re a seasoned yum cha eater, here are some staple dishes to keep in mind the next time you visit a restaurant! These white steamed buns are no doubt a staple of the yum cha experience. With its signature sweet, barbecued pork (char siew) filling, these buns are a favourite to order. Steaming these buns create a soft, unique texture to the bun that matches it filling perfectly. These buns are a must-try if you haven’t! Another key staple in the yum cha experience, shao mai are the yellow dumplings you see on the carts. With pork, prawn, mushrooms, and topped with crab roe, this dim sum dish is one of the most popular. You can eat it alone, or dip it in Chinese chili sauce for another kick of flavour! This is one of the most unique popular dim sum dishes. The xiao long bao is a dumpling that contains a small amount of soup with its meat filling. Take care not to puncture your dumpling before it gets into your mouth! The moment you bite into the dumpling and the soup inside is revealed is what makes this dish so unique and tasty! It is often served with vinegar, which adds another layer of flavour to the dish. The rice noodle roll is often served on a plate and can contain prawns or barbecued pork as a filling. On the plate, it looks like a flat, white strip. Your waiter will pour a brown sauce on top of this delicious dish before serving it. You can’t miss this when you go to yum cha! The taro dumpling is another unique dish that you’ll only find at a Chinese restaurant. It is made with mashed taro, diced mushrooms, shrimp, and pork. This unique combination creates an incredible flavour which matches well with its fried exterior and will leave you wanting more! These Chinese dishes are delicious and a must-try for Asian cuisine lovers! Some restaurants will serve them even if they aren’t doing yum cha, so look out for these great dumpling dishes!